You can easily stroll or bicycle around the fun beach-town of Kihei and enjoy excellent ethnic restaurants, or taste Hawaiian-inspired dishes and drinks at local eateries and diners that are within walking distance. Or take a drive up to the top of Haleakala volcano to witness the stunning sunrise, hike, do the famous Maui downhill bicycle ride, or even catch the magnificent sunset. If you want to stay active there are a multitude of outdoor activities, from scuba diving and snorkeling, to golfing and water sports, all just minutes from the Aloha AKU. Or just hang out on the property and bask in the sun and the gentle waves of the beach just steps away from your lanai. 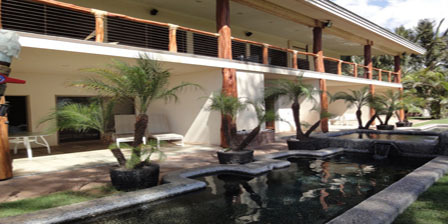 All the units get to enjoy the hot-tub and plunge pools that are highlighted with hand-carved tiki torches. Unwind inside Aloha AKU’s luxuriously appointed 1-bedroom beachfront suites, each featuring complimentary high-speed wireless internet, AC, DirecTV, and contemporary décor infused with local Hawaiian styles and accents. Nicely equipped kitchens, separate living room areas, and luxurious master bedrooms/walk-in baths in each suite will help make you feel right at home. Or enjoy our 2 bedroom Ohana with full amenities and a fantastic garden-wetland view also just steps from the beach. Now accepting inquiries and reservations. For the Wet World folks we have Paddle Boards, Kayaks, Boogey boards, beach chairs, beach towels, snorkel sets, life vests, and many other water related items for your use while you are visiting Aloha Aku. For the Land Sharks we have Road bikes and helmets, Golf clubs, Tennis rackets, Bocce ball, Frisbees, and much more for your use. For the more Laid-back folks we have an eclectic reading library, a 400 DVD collection, many board games, Outdoor shared grill, a lush garden filled with many local plants and over 10 kinds of palms, and more, to help wile away the hours. For the Workout maniacs we have Spin bikes, a rower/bike, light weights, yoga mats and more so the you can work up a sweat with a smile on your face. In the large Common Area we have a shared printer for your use, a RO water filtration system, an ironing board and iron, a dishwasher and a generous supply of minor items that you might need during your stay. We also have extra continental breakfast items like yogurts, juices, pastries, fruits and more as well as many Keurig coffees to keep your in-room refrigerator stocked with yummy breakfast choices. There is a separate Laundry Room attached to our garage for our guests to use at no extra cost. We have detergent and bounce dryer sheets and everything in there so you shouldn’t need to worry about a thing. Park your car for free on the generous on-property parking area along the pond. Enjoy the fresh ocean air and beautiful Maui climate. And in your Suites we have DirecTV HD TVs, air conditioning, safes, hair dryer, laundry basket, a cooler for your beach or road trips, the use of Aloha AKU waffle robes, a DVD player, clock radios and high speed wired and wireless Internet throughout the estate. The total number of guests shall be limited to two (2) adult guests and two (2) minor guests per bedroom.